Kody loving on his baby girl - he's such a good daddy! Tala (Kiona x Kody) as a beautiful adult! Michelle's Tala at 3 1/2 years old - pretty girl! Tammy Leahy's "Big Kahuna" - too funny!!! Kody - a.k.a. "Kody Bear", "Baby Bear", "Stink breath", "Cat Poop Eater", "Momma's boy", "Boo Boo Bear", "No! ", "Stop that! ", "Get back here", "Stud boy", "Burr boy", "Don't pee on that", "You da man", "Koda Monster", "Kodikins", "Kodaman", "Kode", "Kode-ster"
Jessie- a.k.a. "Momma's Baby Girl", "Jesikins", "Jessie Girl", "Jessie Rae", "Jessie May". Fuzzie (Tara X Kody) in training! 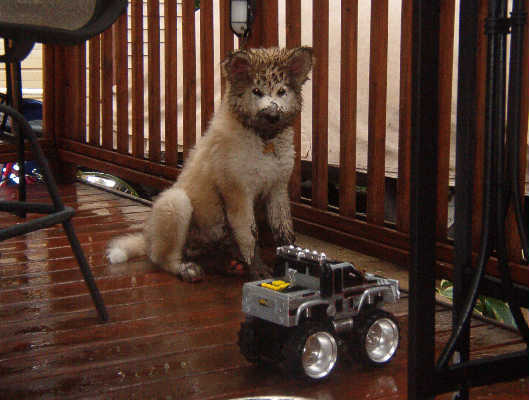 WARNING: Alaskan malamutes are addicting! You may start with one and then, before you know it, you have a kennel full of them.......ha ha! 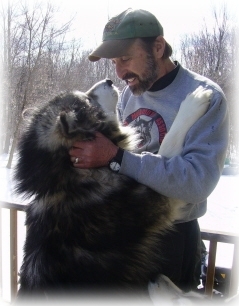 Musher/Author Von Martin from the state of Washington. He owns "Call of the Wild Huskies". 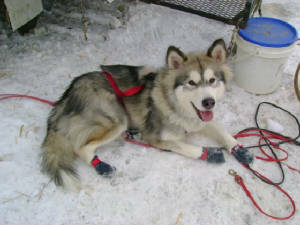 Tara, Kody, and I had the pleasure of his visit in the Winter of 2006!